Koroyd is a class leading energy absorber, with a unique structure which reduces trauma levels with innovative energy management properties. When impacted the Koroyd cores crush homogenously, decelerating the energy from the impact and reducing final trauma levels. It is through the crushing of these cores that the kinetic energy is converted. Traditional energy absorbers convert very little energy, instead acting more like a spring, storing the energy and releasing it over a period of time. This spring like phenomenon is as a result of materials having hysteresis. Koroyd has minimum hysteresis offering a far superior structure to reduce the risk of injury. True energy absorbers offer linear energy absorption capabilities with maximum displacement and minimum return Koroyd stress/strain performance. Graph highlighting Koroyd material properties during compression. 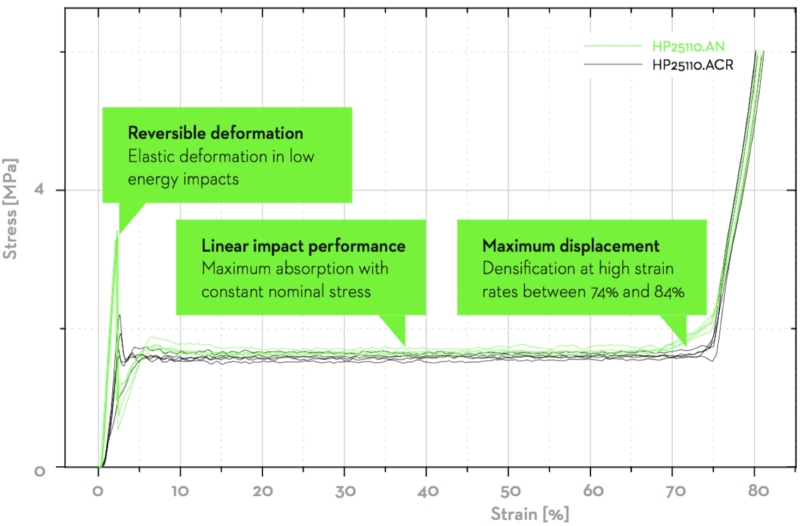 Reversible deformation through elasticity – Reversible elastic deformation of the cores ideal for low speed impacts. 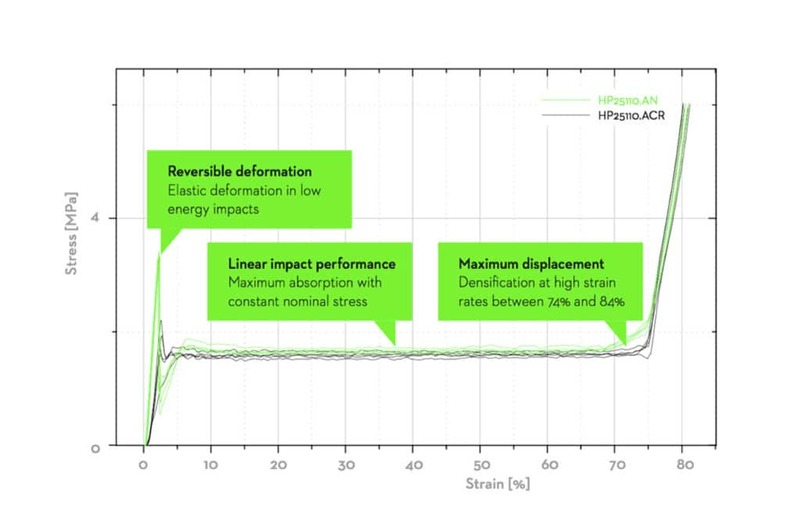 Linear impact performance – The cores plastically deform for higher speed impacts, absorbing energy linearly. Maximum displacement – Upto 84% of the material thickness can be utilised in case of an accident. Existing energy absorbers densify around 60%. Existing energy absorbers’ performance diminishes in the hot and cold environment. 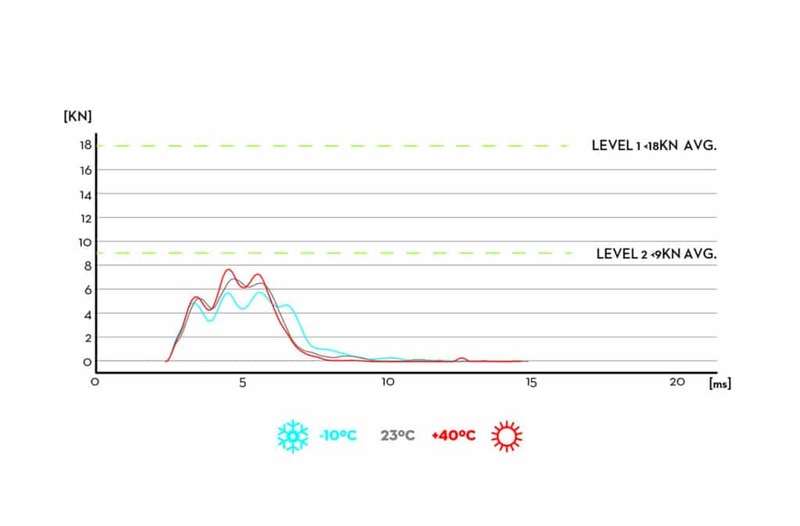 Koroyd is more stable, ensuring consistent impact absorbing capabilities in a wider range of temperatures. Graph highlighting Koroyd core when impacted under EN1621-2 at -10ºC, +23ºC and +40ºC. 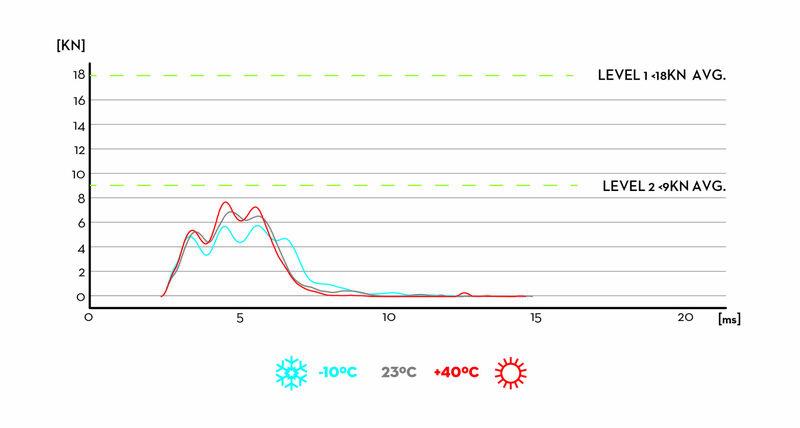 Only a marginal difference in transmitted energy across the 50ºC temperature range.